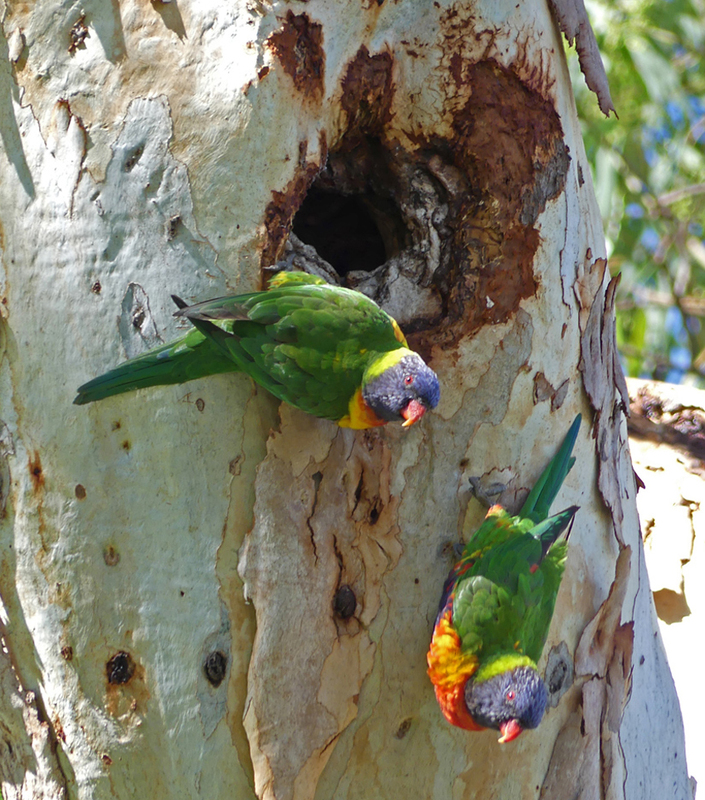 There are two rainbow lorikeets perched halfway up a red gum. They are exploring a potential nesting hole. First one bird pokes its head in then the other. Their house hunting is accompanied by much squawking, head bobbing and an occasional nip at each other. Just when they seem to have decided that this is the right site, a magpie lands on the branch just above them and both parrots take flight. 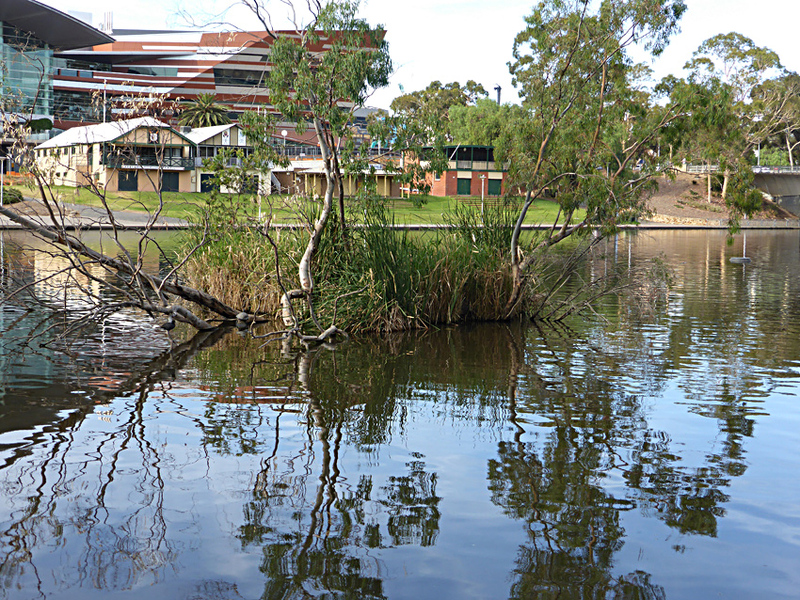 I am in Bonython Park by the Torrens River; downstream from the weir and opposite the Coca Cola factory on Port Road. Below me cycle and walking trails surround the waterway and a small causeway and larger train bridge cut across the river. 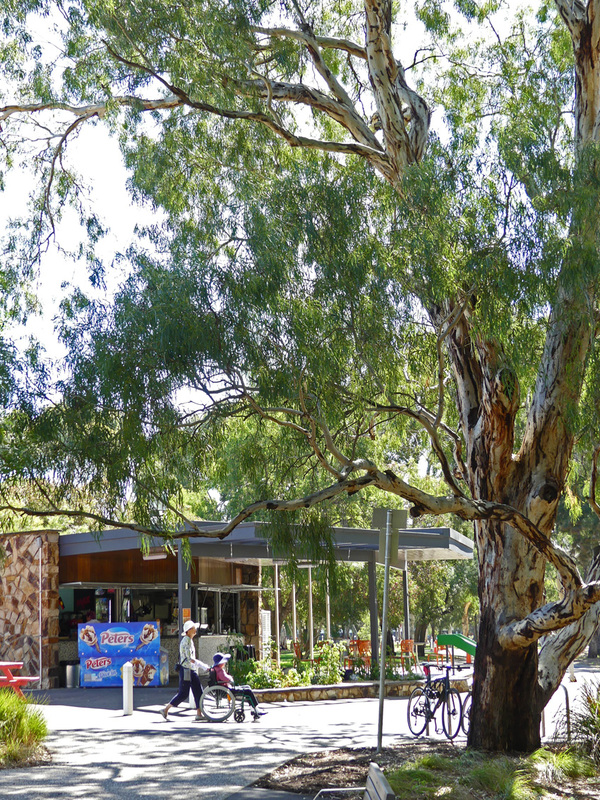 The park abuts the holding paddocks for the police greys by the old jail and includes wide expanses of green space, a shallow paddling lake, kiosk and children’s playgrounds. From the recreational area I walk down to the pathway then head back upstream towards the train-bridge and city. 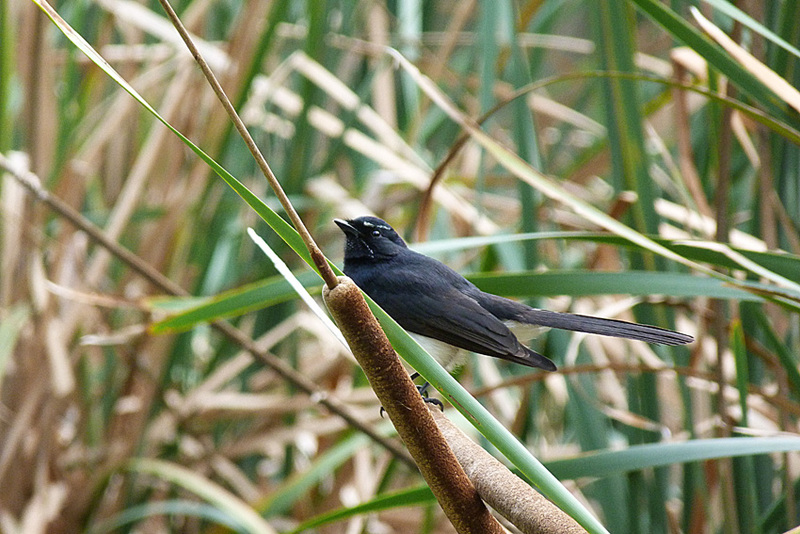 The river bank is cloaked in tall reed beds and I can hear numerous small birds moving and calling in the jungle of stalks and leaves. There are several grassy areas that are free from the reeds and they provide opportune places to sit and observe the river’s wildlife. 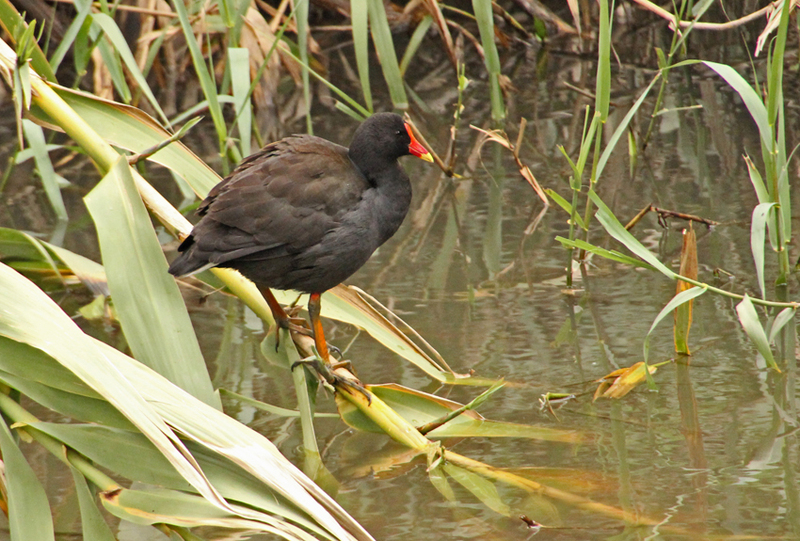 Coots, moorhens and purple swamp hens are common along this stretch of water. 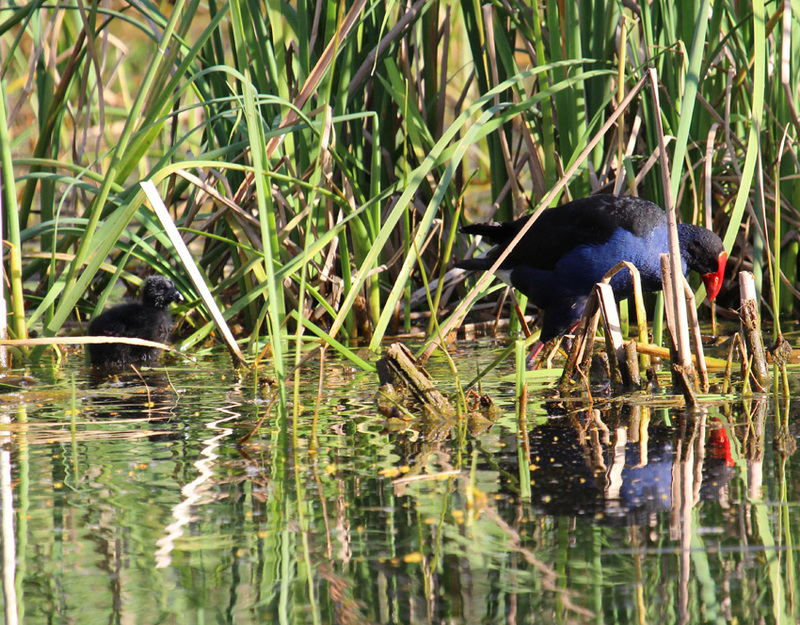 The coots and moorhens tend to be in the water paddling close to the cover of the reeds. 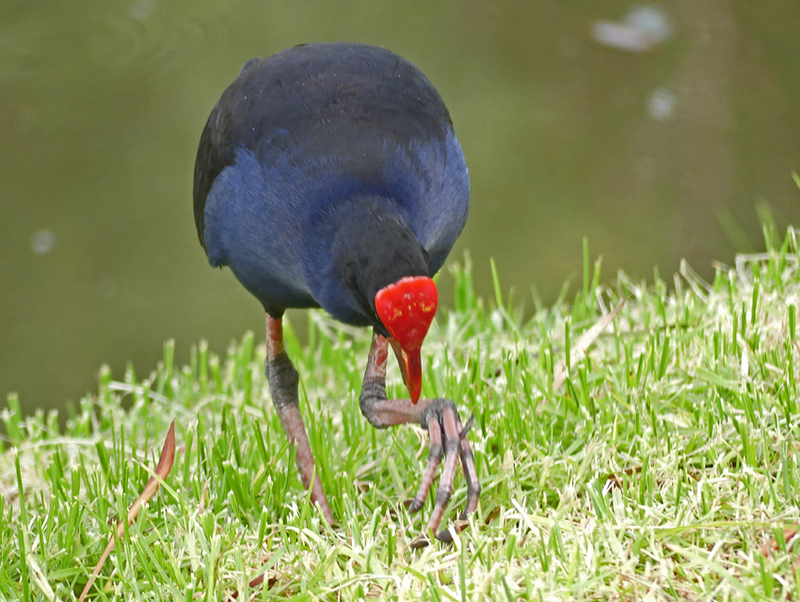 The swamp hens are more often seen in amongst the tangle of plants by the bank where they use their elongated feet to walk gingerly on the fallen reeds that form a mat on the water’s surface. 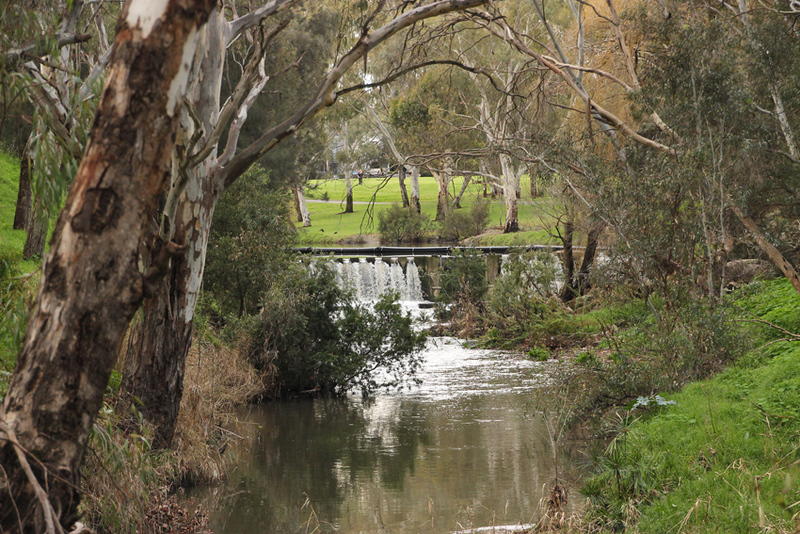 The view from the bridge to the ford provides a good oversight of the river and eucalyptus trees that line the banks. However, the bridge is also a perfect shelter for a number of different animals. Over the years I have watched water rats foraging here and even a fox that was taking shelter during a rain storm. 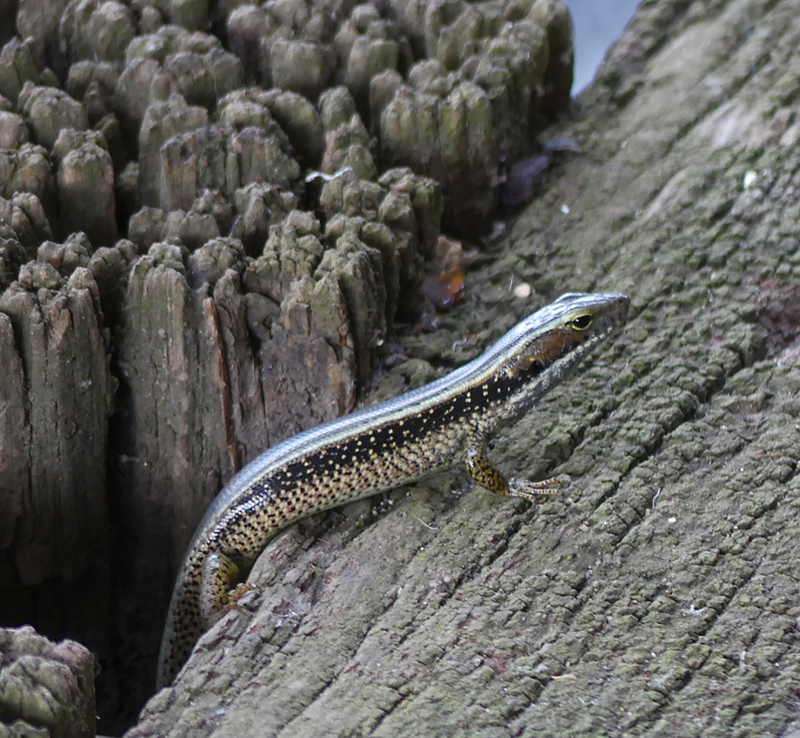 Today it is an eastern water skink that makes an appearance as it forages amongst the old wooden foundations of a pathway that runs under the bridge. Downstream from the bridge there are several islets made from debris that has floated down the river during recent floods. 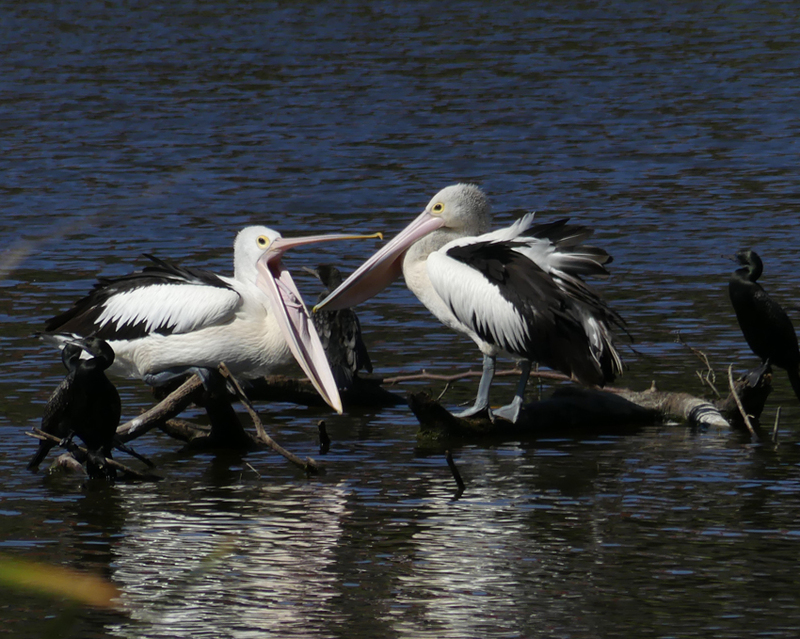 Several pelicans have claimed this territory as a resting place and are squabbling over squatters’ rights. They duel with their beaks, neither giving way, while disturbing a group of black cormorants that are using the same area. I am almost back to where I started when I find one last target for my camera. 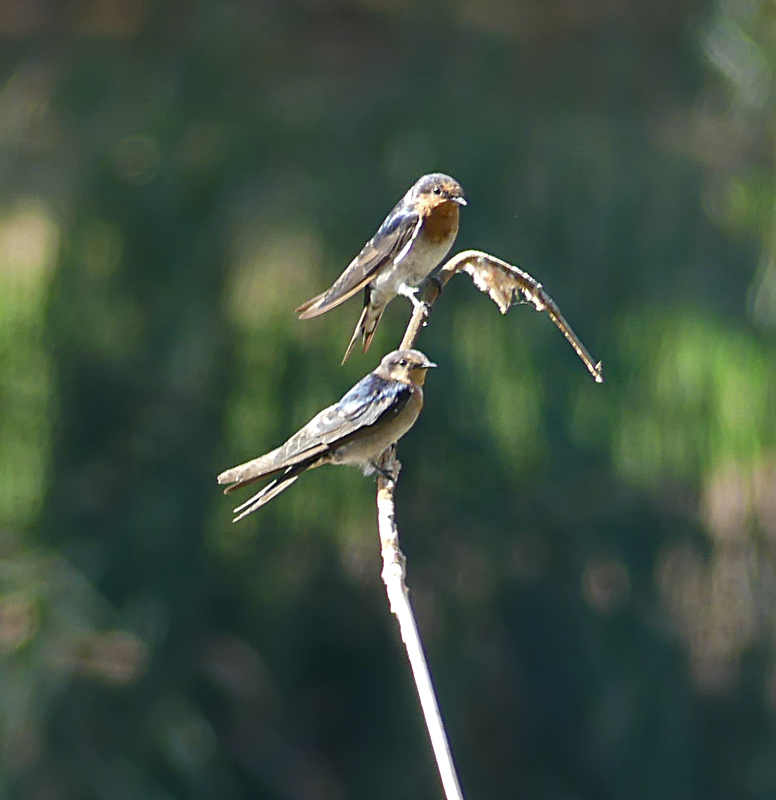 Two swallows are perching on a papyrus stem where they are making forays over the water to hawk insects. Swallows are not the easiest birds to photograph as they are incessantly on the move but this pair has cooperated even though they are still at the extreme range of my equipment. 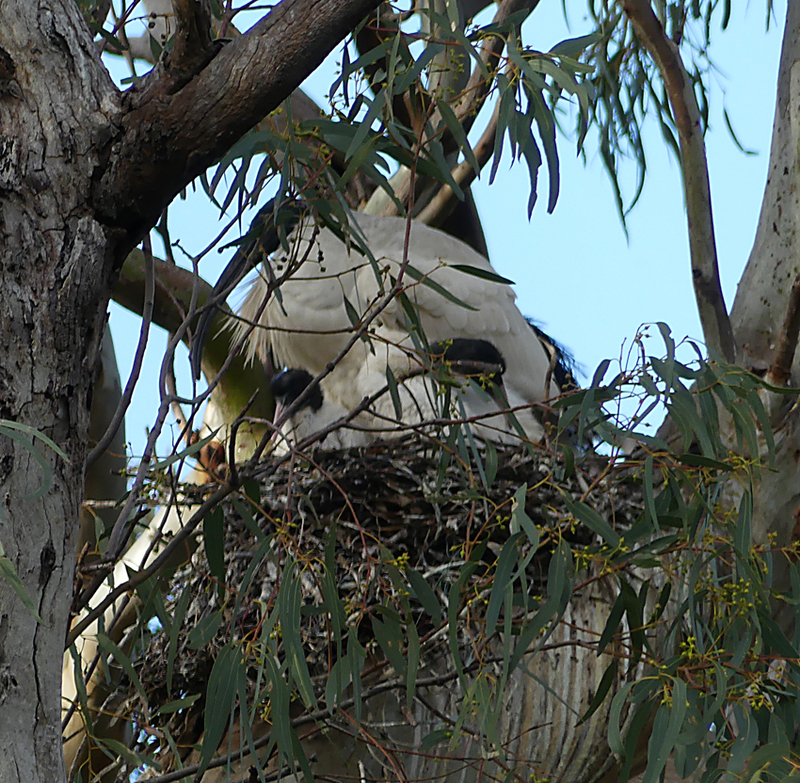 There are ibises along the banks of the pond and high in a river gum. One pair seems to be concentrating on a particularly dense area in the crown of the tree. I look more closely through the telephoto lens. It is a nest, barely discernible amongst branches. 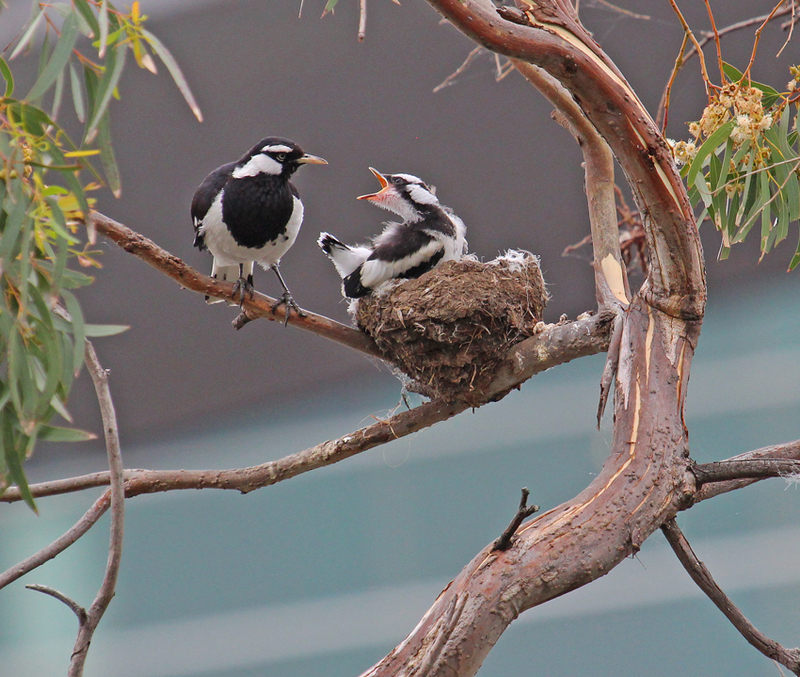 Closer inspection reveals a pair of chicks nestled against one of the parents while the other has left in search. I am walking along the pathway that runs from Montague Road to McIntyre Road behind the little complex of shops that includes Katmandu, Bunnings and Subway; just a few hundred metres before TTP. It is best to park next to the creek appropriately behind the outdoor shop then walked over a small traffic bridge to Victoria road. 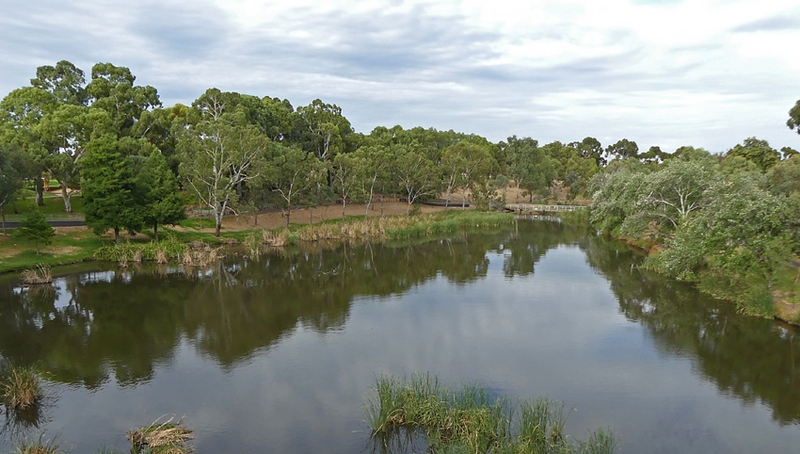 After a hundred metres, head left over the footbridge that crosses Dry Creek past a large pond where the ibises gather. Leaving the ibises to their domestic duties I follow the creek using a small track along the bank. 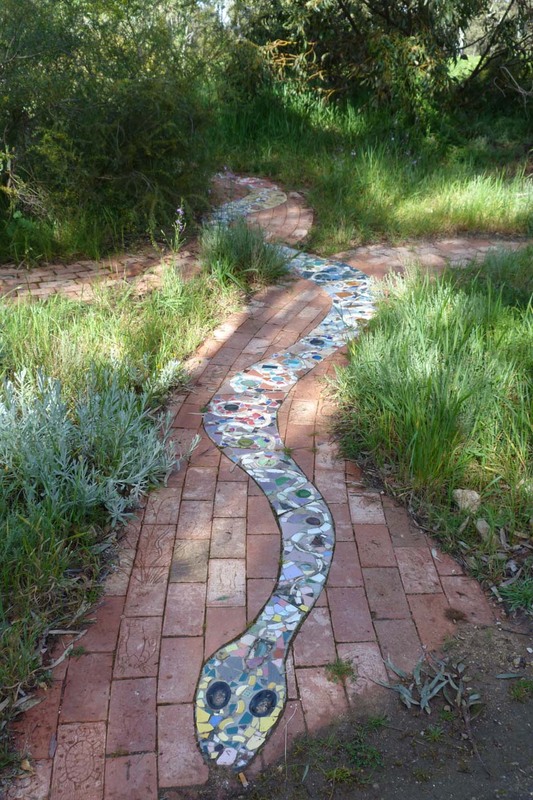 Alternatively a new concrete path traverses the same route. 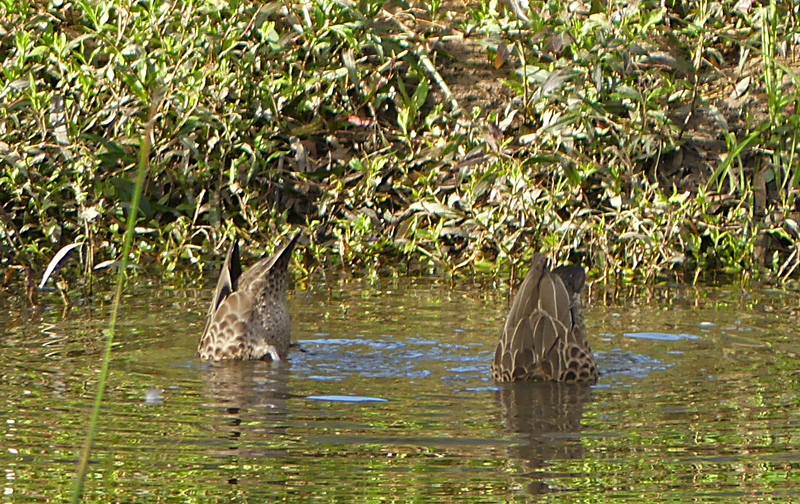 There are waterfowl along the creek which is flowing quite fast after heavy winter rains. 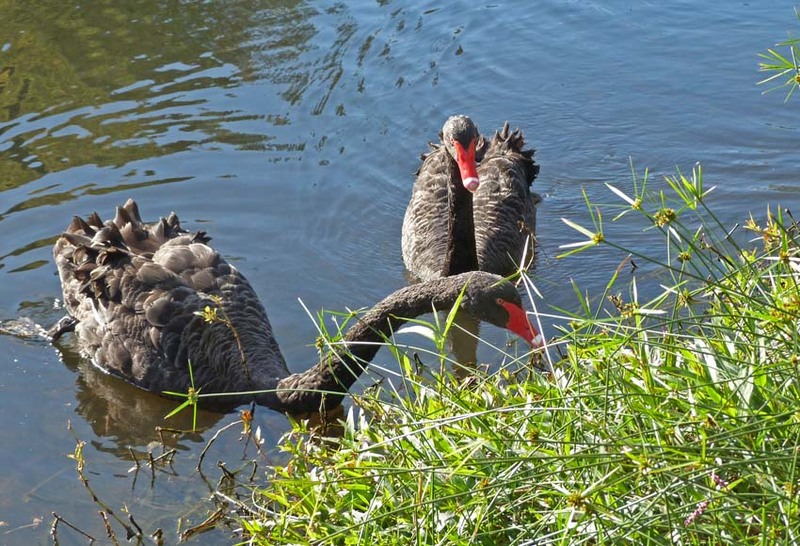 In a slightly calmer stretch where a curve in the creek creates a sheltered pool a pair of black ducks, recognisable only by their upturned tails, are feeding on the bottom. 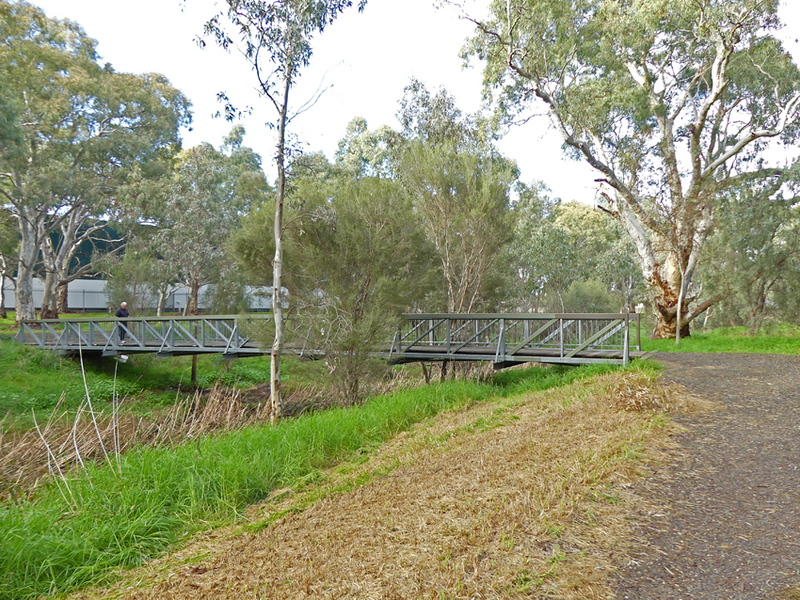 After a couple of hundred meters I come to the third bridge which crosses the creek and bends back to the car park and lunch. However, alongside the bridge there is another rough dirt track that leads into the scrub emerging at a lovely secluded section of the creek. 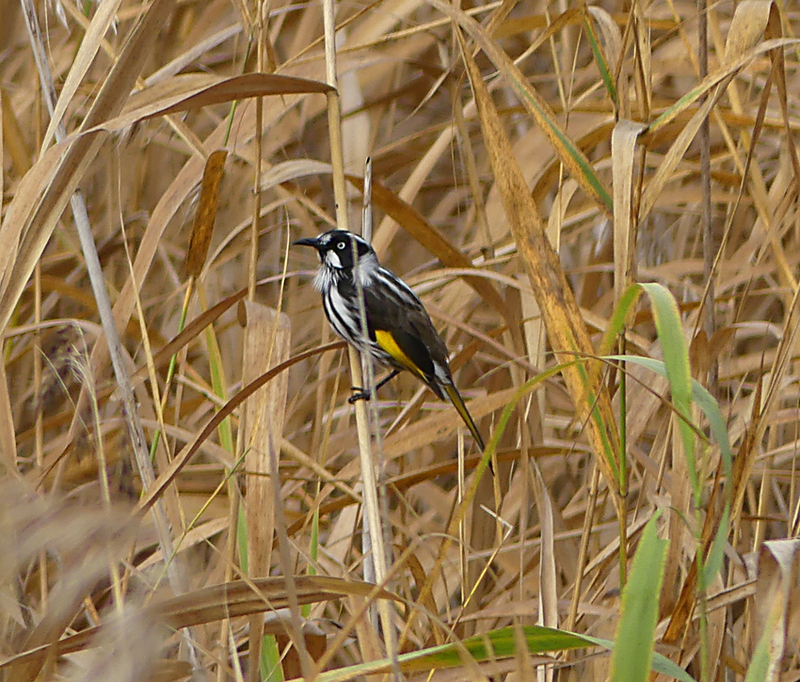 As I follow this trail I come across a variety of smaller birds including some New Holland honeyeaters that are perched in the reeds and a flock of musk lorikeets squawking high in a huge red gum near the trail junction. I back track to the bridge, cross it, turn left following the main watercourse and stop to photograph a small waterfall that has developed in the creek. From here the track branches left running alongside a steep banked gully with very little water in it. Back at the car park I can get some lunch, shop for outdoor gear or find some hardware to occupy the remainder of the day. Thank you for your comments regarding my change of style to a field notes format. Most people seemed to prefer the original recount genre and therefore I will return to writing in this manner. 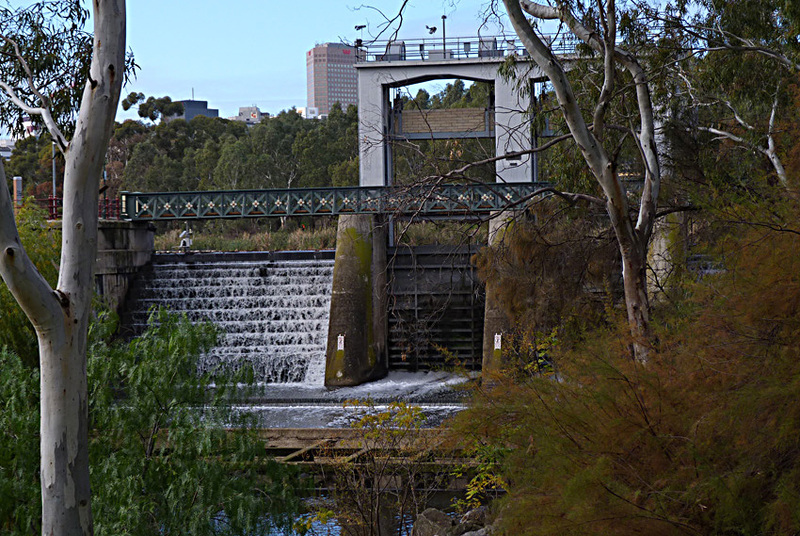 From the walkway where I am standing I can see the V shaped ripples of an Australian water rat swimming towards the concrete lattice work at the foot of the weir. I am always excited by the chance to photograph these elusive mammals and despite the overcast conditions I am in a good position to get a few nice pictures; if the little creature cooperates just a tad. 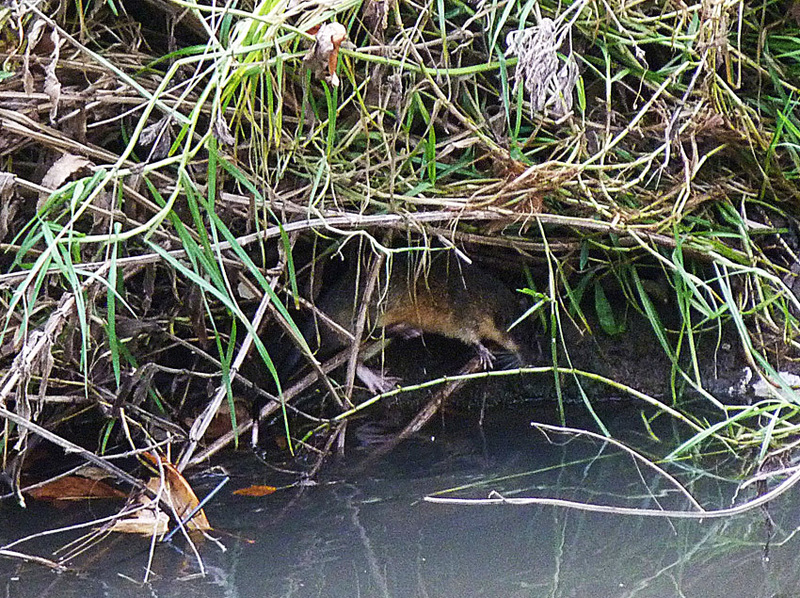 When the rakali (another name for the water rat) reaches the reeds instead of disappearing, as usually happens, it dives under the concrete barriers and hauls itself onto the flat surface. After settling for a few seconds it has a quick look around, grooms its fur then slides back into the water. Oh yes; there is a god of wildlife photography. 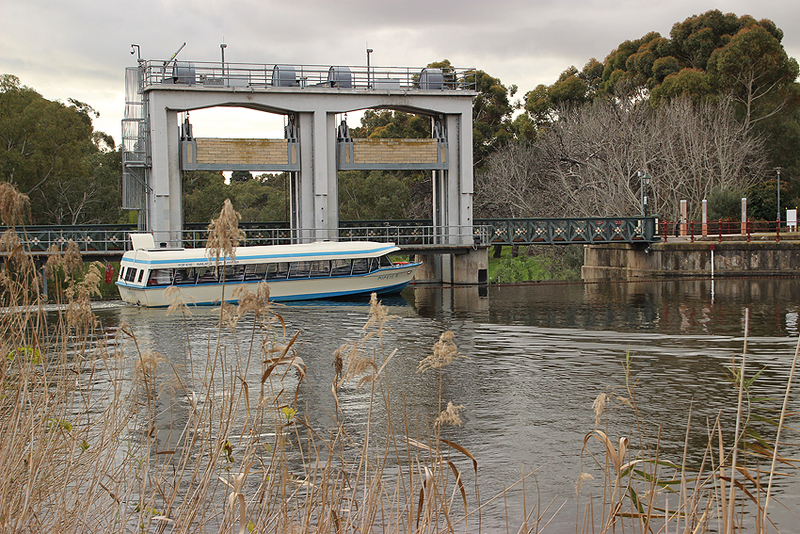 I am at the end of the Torrens Lake by the Weir. It is a place where cycling and walking tracks converge, the iconic Popeye makes its turn for home and the par 3 golf course begins. 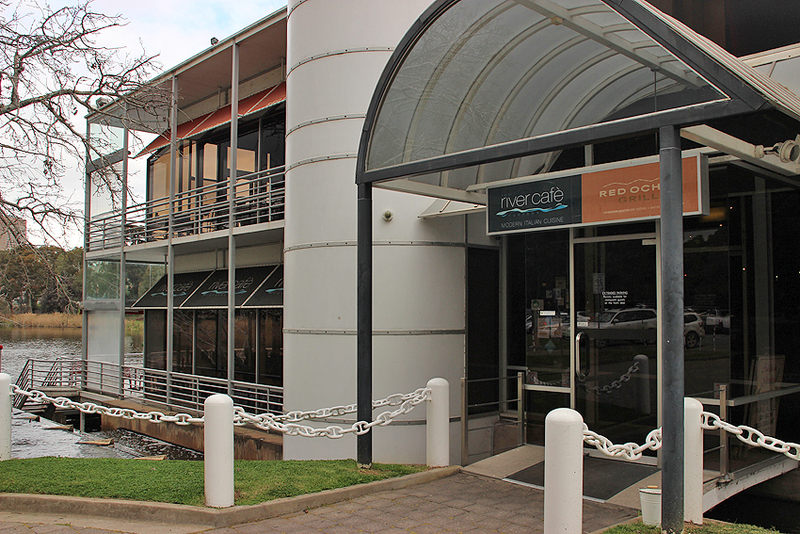 There are also free city bikes at the little kiosk and the Red Ochre/River Cafe restaurant complex which provides excellent dining and wonderful views across the lake towards the city. 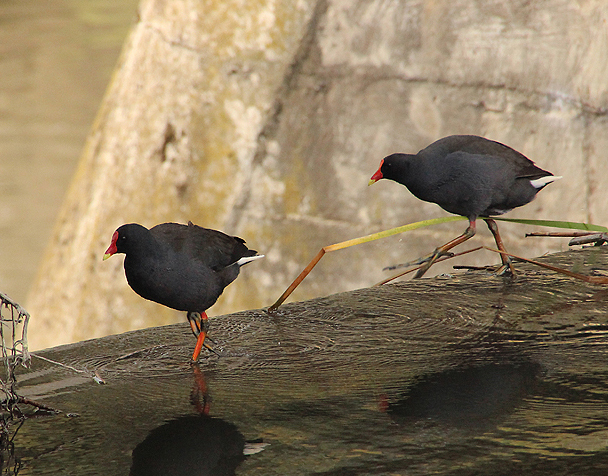 On my way to a coffee before heading home I can’t help but notice a pair of dusky moorhens delicately tripping across the top of the spillway. They follow each other for some time, apparently with amorous intent. Yes, spring is in the air. 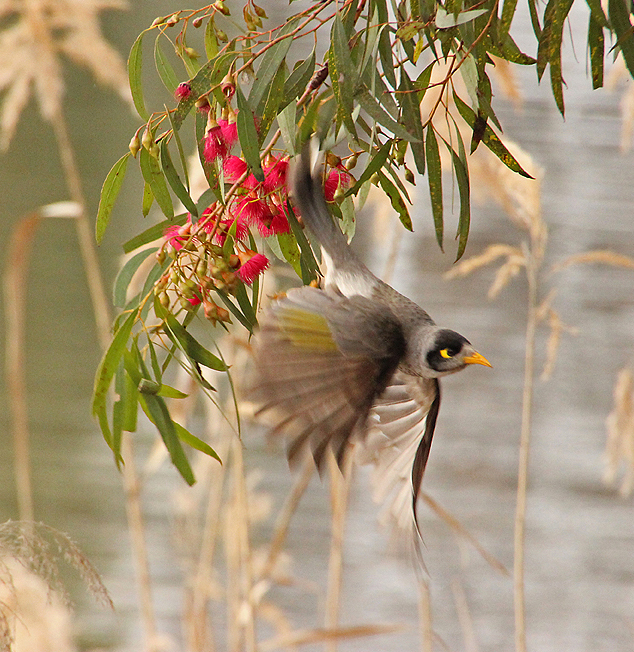 Noisy miner birds are common along the river bank (not to be confused with the introduced Indian Mynah that plagues Sydney) and a small group are feeding close to the weir. 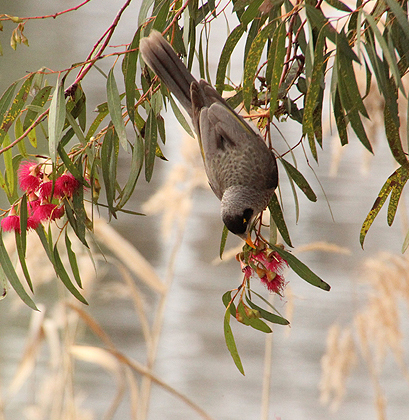 One particular bird hangs from a slender eucalyptus branch as it gathers nectar from the blossoms then kicks off in flight. 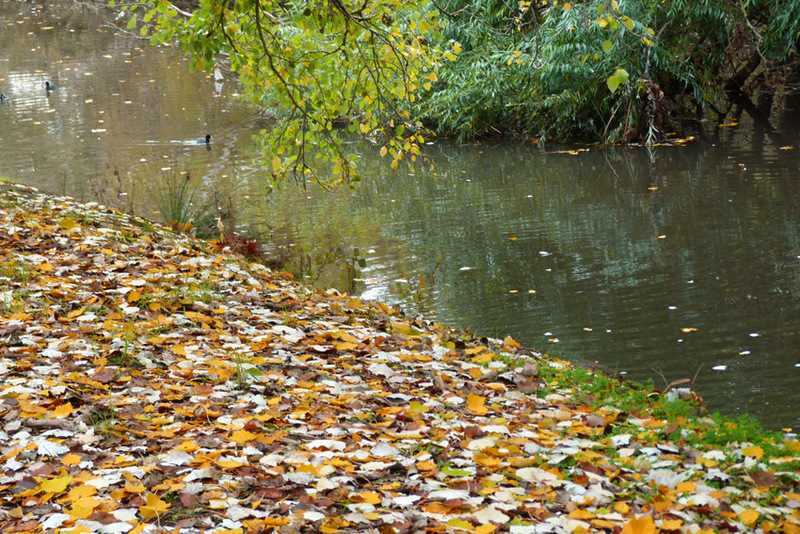 A nice couple of images to finish my walk by the water. As I have categorically stated in several of my posts, “I am no botanist”. I love gardening and appreciate the wonderful diversity of South Australia’s flora but remembering all the different classifications, names and botanical intricacies is just a little too much like hard work. 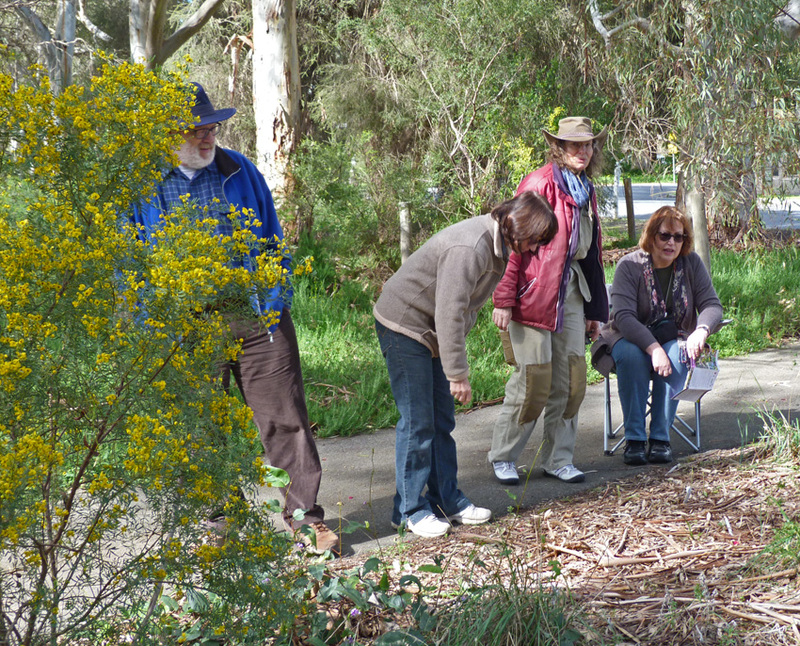 Instead, I rely on a couple of field guides to common plants in the Adelaide area, phone a friend or simply make reference to those yellow bushes or tall straight eucalypts. Hopefully, this gap in my naturalistic armoury will be narrowed as I write more nature posts, though the signs are not promising. So: it is with some trepidation that I lead into the following piece ……. 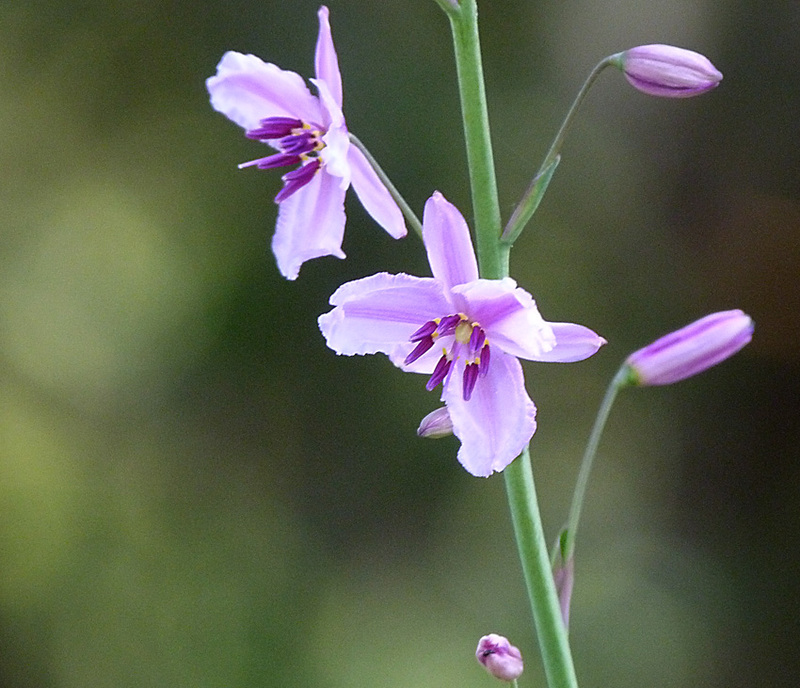 ….It is a cool winter’s day, slightly overcast and I am on my knees examining a glorious little patch of native orchids. 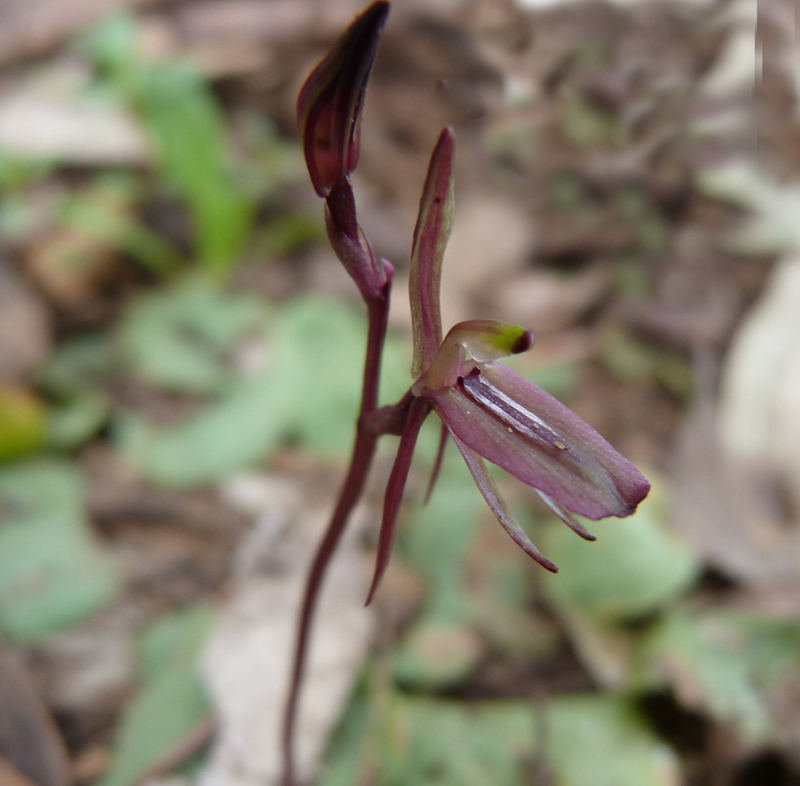 Most are pink fairies but there is one tiny delicate bloom, the size of a little finger nail, called a gnat or mosquito orchid. Nearby several of the flat prostrate leaves indicate where other orchids will appear in the near future. All of these species are endemic to the area and though a few might have grown naturally, most are the result of a dedicated group of volunteers who are revegetating this area which is part of the Vale Park Wildflower Walk. 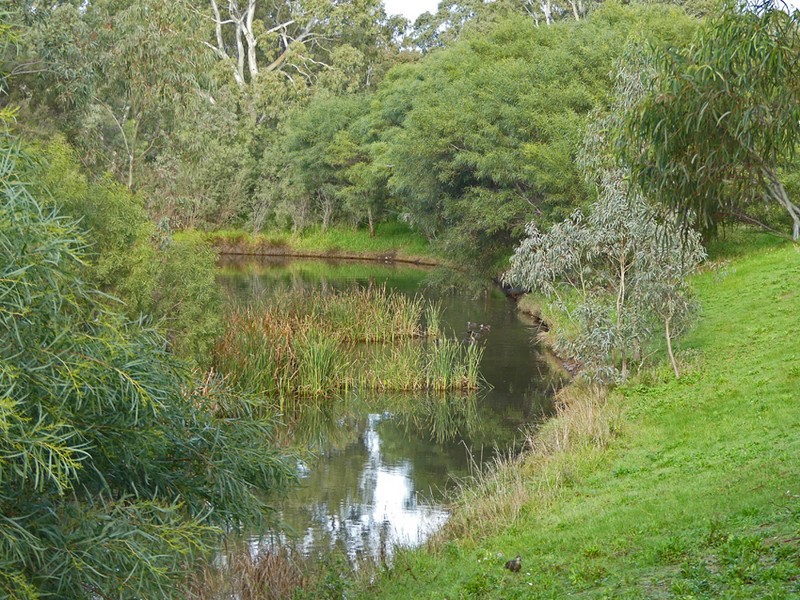 The section I am exploring is alongside the Torrens River just east of the autobahn bridge near the Bickle Reserve. Several of the Vale Park group are holding an open morning and explaining the importance and biology of the plants they have established. 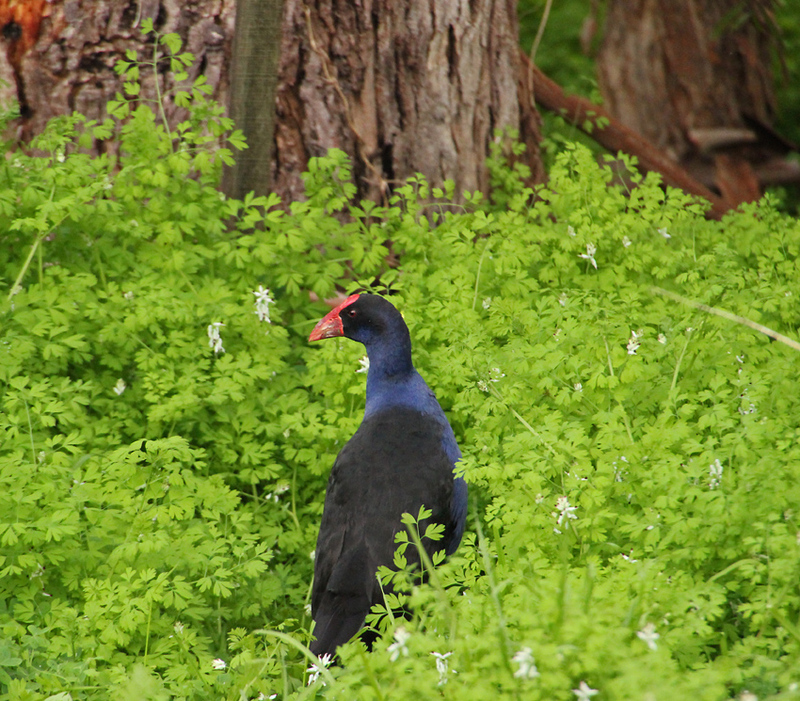 As I listen to information about the relationship of certain fungi in the soil to the propagation of orchids and marvel at the spidery native clematis and hardenbergia that are climbing up some eucalypts (big tall ones) I notice a pair of purple swamp hens foraging in the long grass by the river. Leaving the group I pursue the birds and make my way along the bank where there are also dusky moorhens in the reeds and crested pigeons feeding near the bikeway. 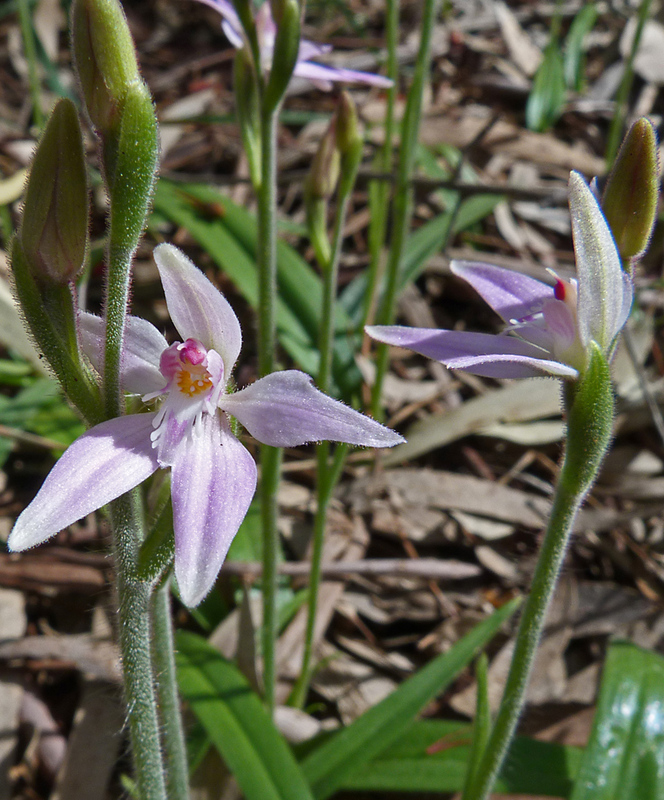 Rejoining the group I chat about the importance of maintaining our wild heritage for future generations and learn about Aboriginal use of some types of native plants including orchids. Predictably in this group I encounter another wildlife photographer and the conversation fluctuates between nature and the lenses we have used for different purposes. 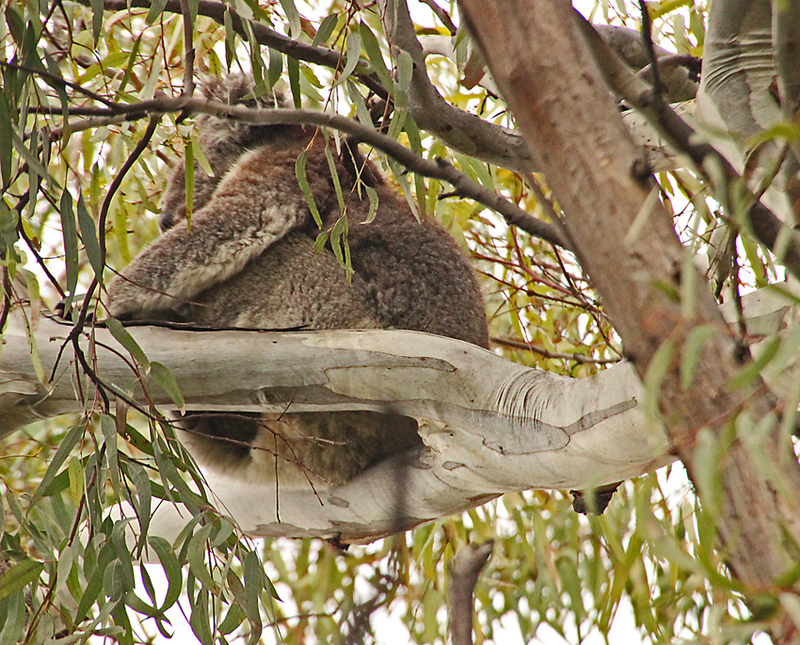 In the course of our conversations one of the replanting team asks me if I have any images from the area and I remember that on a bike ride along this part of the linear park trail I had photographed a koala high in the largest eucalypt overshadowing the orchid beds. But, in keeping with my botanical prowess I forget to ask what kind of species it is (probably a tall, straight one). Check out Geotravelling a new site that I have attached that celebrates the natural, cultural and urban diversity of our planet through my travel photographs. Sunday morning is for bike riding. 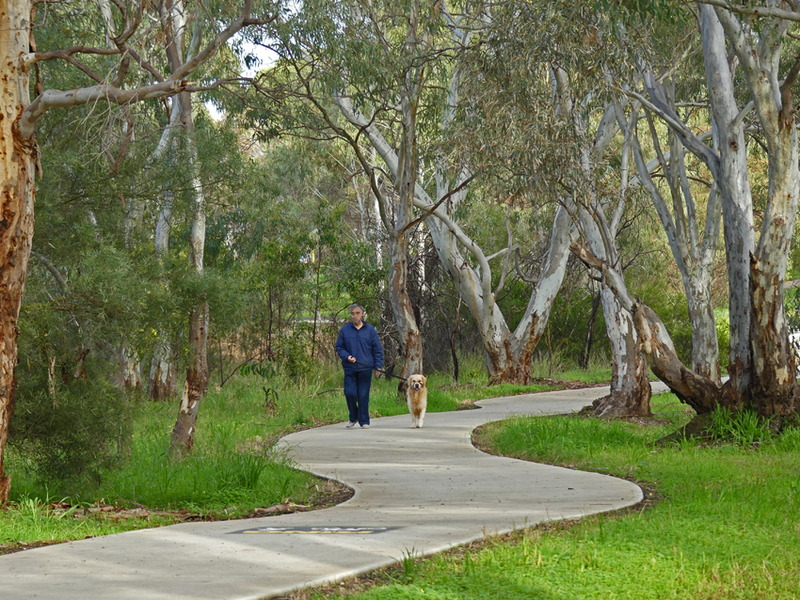 A time to drop my little point and shoot into the non-lycra shorts, haul the mountain bike out of the shed, and cycle through Adelaide’s extensive parklands or along the linear park trail which follows the Torrens River. 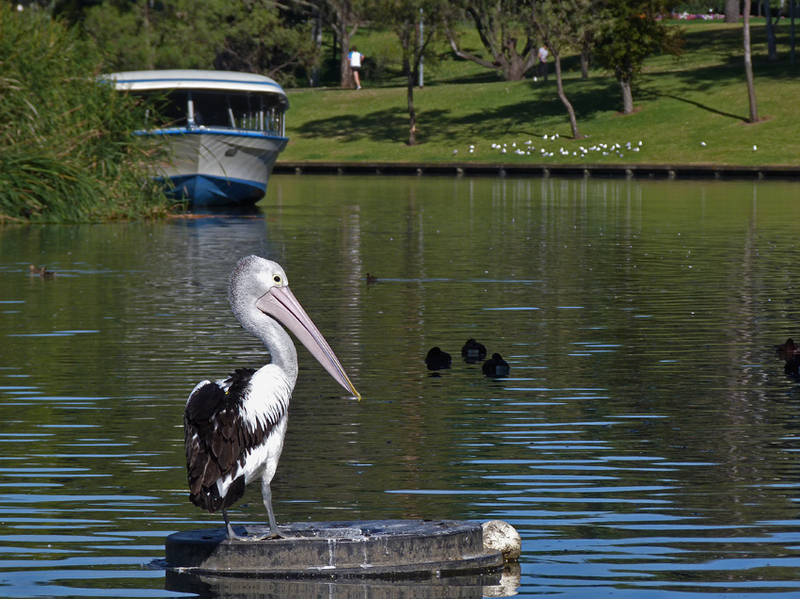 On this particular morning I thought it would be nice to ride around the Torrens Lake which sits on the northern edge of the city by the picturesque Adelaide oval. 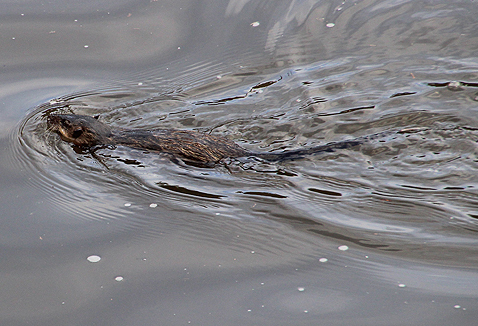 There is always a wide variety of wildlife on the banks of the lake and my long-time photographic adversary, the water rat, can sometimes be found near the tiny island opposite the paddle boats. In fact, on my last excursion around the lake I caught sight of one of the elusive little rodents paddling into the reeds that form the bulk of this tiny refuge. Unfortunately my journey past the island yielded no results on the water rat front but it did turn up a couple of quite unexpected visitors; a pair of nesting mudlarks with fully fledged young and a long necked turtle basking on a partially submerged tree branch. However, as the island is a good 40 metres from the bank and the targets fairly small, capturing good, clear images was always going to be a problem. Nevertheless, I fired off a series of shots as the birds and certainly the turtle might be gone before I could return later in the day armed with a DSLR and long lens. Several hours later, in somewhat overcast conditions, I parked my car by the weir alongside the golf course and iconic Red Ochre restaurant at the northern end of Memorial Drive and walked along the path towards the little island. The banks along this part of the lake are thick with tall reeds and both purple swamp hens and dusky moorhens use them for shelter and nest building materials. Despite many distractions, I finally reached the section of bank opposite the island and set about photographing the magpie family. 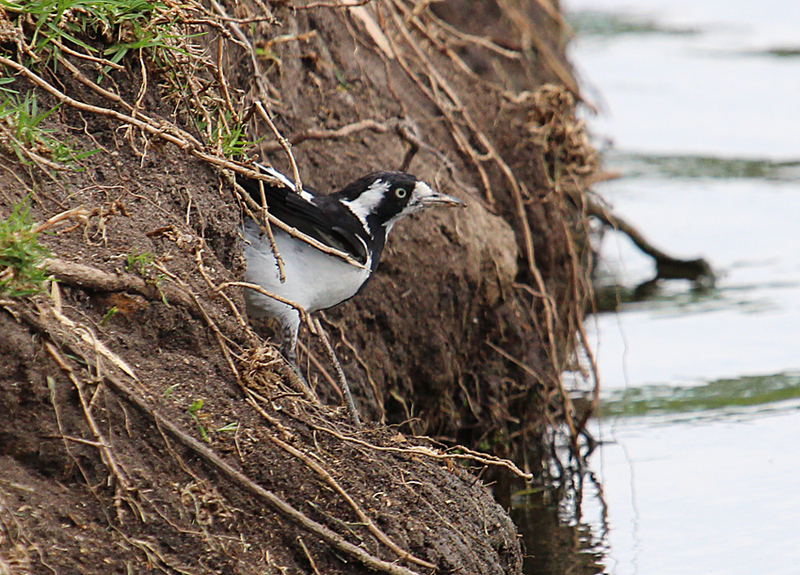 The adults were fossicking for grubs in the muddy banks close to where I was sitting and feeding the young as they squawked for food in the crowded nest. 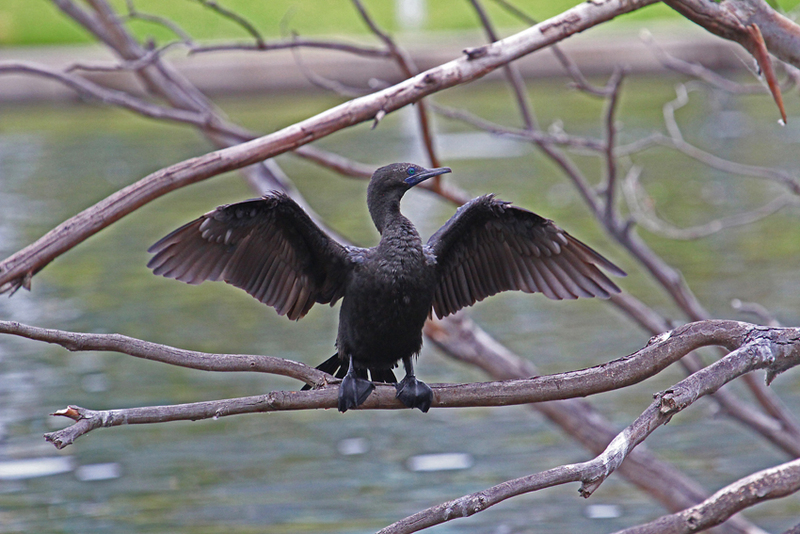 Below the nest, a pair of black cormorants perched delicately on a dead branch stretching out the­­ir wings to dry after hunting carp in the lake. 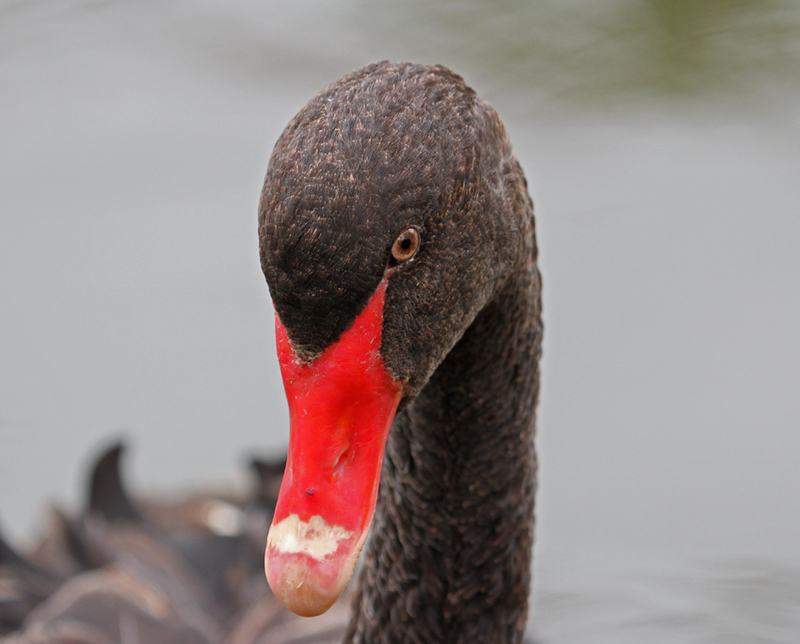 After about 30 minutes, a large black swan that had been cropping the grass nearby waddled over to keep me company. Swans can be aggressive and this one certainly had something in mind as it settled no more than a metre away and glared at me intently. Over the years I have often observed large groups of birds congregating around a local personality who I refer to as John Swan. He does not feed them but simply spends time with the birds; perhaps this particular swan mistook me quietly sitting on the bank for John. Finally the swan’s enthusiasm waned and it nonchalantly wandered off to crop the grass leaving me to finish documenting the tiny island’s wildlife community. 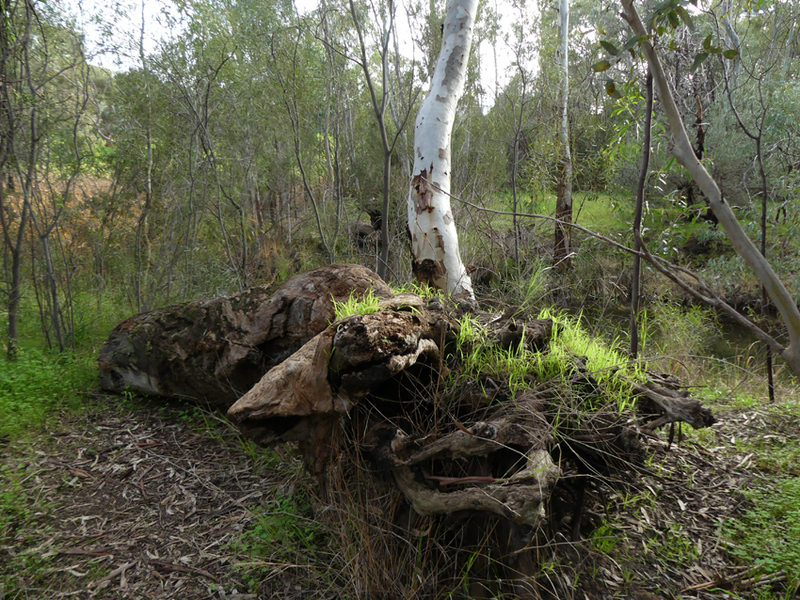 The word billabong looms large in Australian folklore. 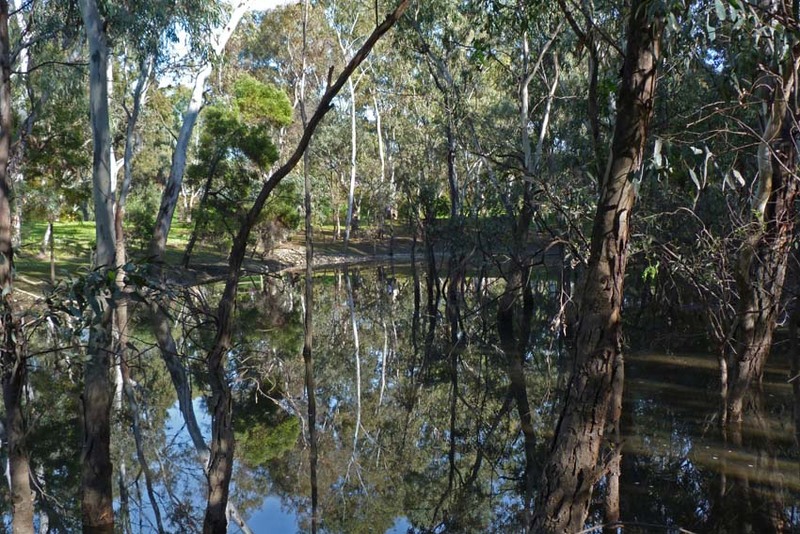 It is where ‘a jolly swagman’ met his untimely end and mythical beasties called ‘bunyips’ supposedly emerge from the water to devour unwary campers. In reality, billabongs are freshwater wetlands that flood when river levels are high then become more isolated in the dry season. They are essentially backwaters that provide a refuge for many different species of animals as well as being popular locations for camping and fishing. In South Australia the lower reaches of the Murray River has many lovely billabongs that have provided me with many a peaceful afternoon’s wildlife watching and photography. 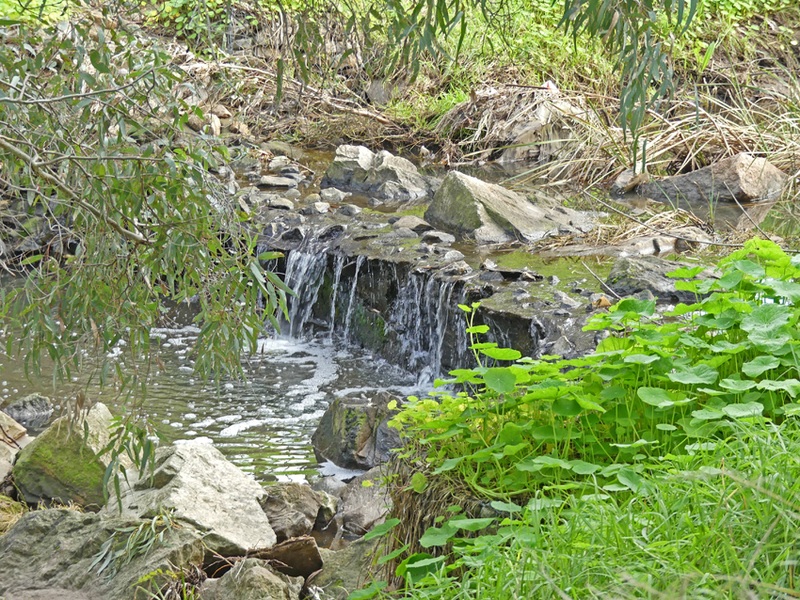 However, the trail that runs along the banks of Adelaide’s Torrens River also incorporates a little billabong which is tucked behind the upmarket suburb of St Peters, just a stone’s throw from the CBD. 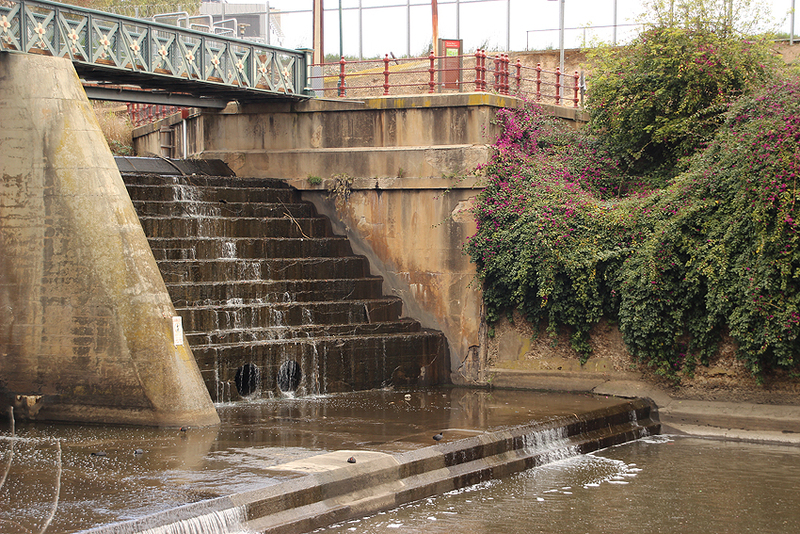 It was rehabilitated in the mid eighties and over the intervening years various community and government groups have overseen its care and maintenance. 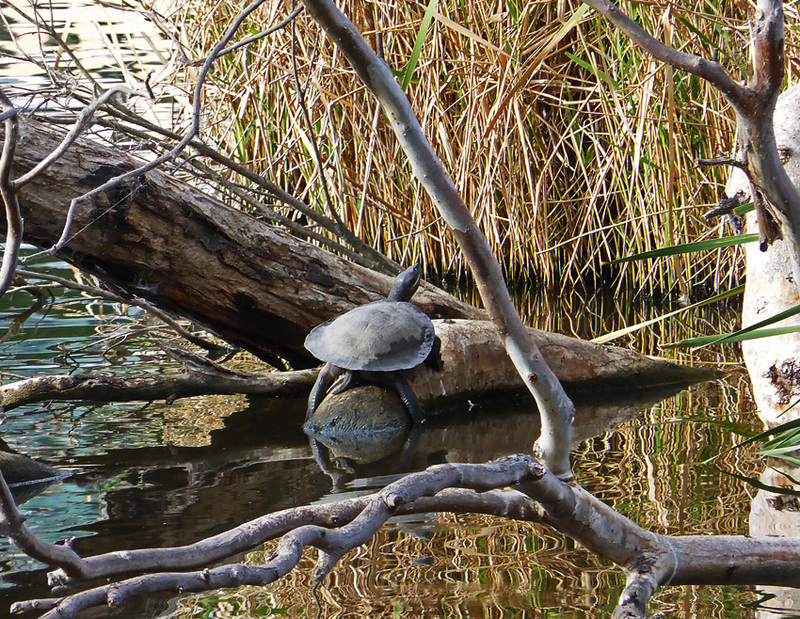 Last weekend, I packed my little super-zoom camera, hopped on the bike and pedalled up to the billabong to take stock of the wildlife. It has been a long wet winter and I was hoping that the warmth of the first few weeks of spring would stimulate some wildlife activity. I was not entirely disappointed. 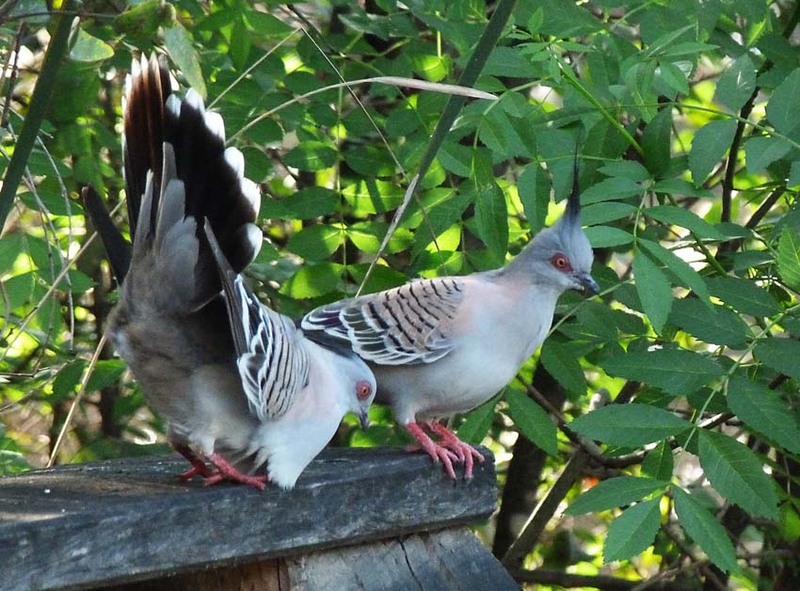 As I approached the little wooden landing that fronts the water, a pair of amorous crested pigeons pranced and displayed to each other. Close to a patch of reeds a mother black duck was tending a pair of fluffy little ducklings. 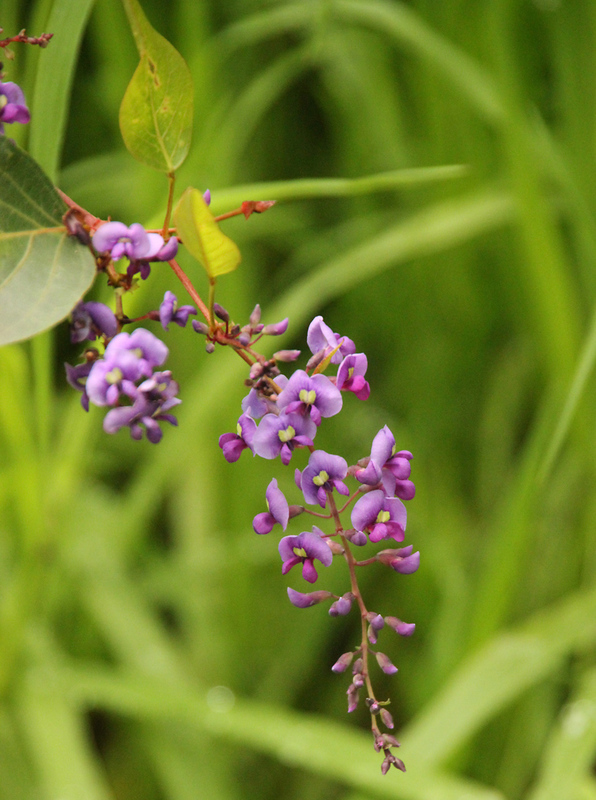 During the winter months the landscape may be verdant but few of the native shrubs flower and the insects that rely on the blossoms are rare. Now the billabong was clearly beginning to emerge from its winter blues and life was starting to reassert itself. 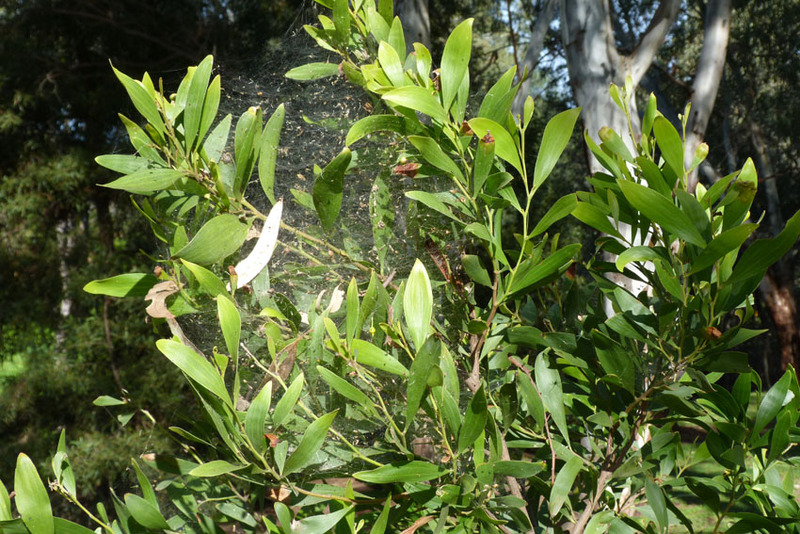 As well as the hormonal pigeons and baby ducks a colony of colonial spiders had constructed a silken trap in an acacia bush and delicate little purple chocolate lilies were emerging from their winter dormancy. As spring turns to summer I am sure the wildlife will continue to flourish and I look forward to revisiting and reporting back to you. This year, the first few days of winter have been a little cloudy with a light mist over the city in the early hours. It is the kind of weather that encourages a cup of coffee, at the Par 3 Cafe by the Torrens Weir, before my weekend bike ride around the river trail. But the cool quiet mornings do have one distinct advantage. 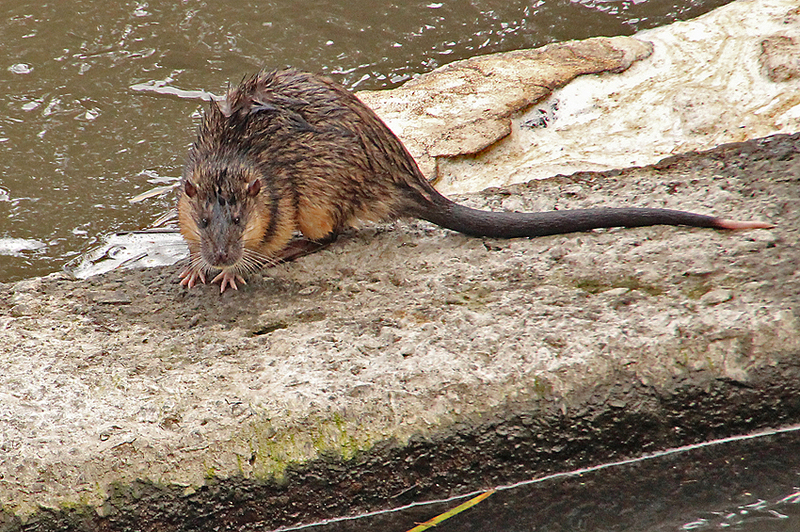 Some of the more reclusive creatures that inhabit the river banks seem a little less wary and easier to find; most notably…The Australia water rat…one of my favourite species. As you can imagine, misty mornings, shy wildlife and carrying a camera on a bike does present a few challenges. My digital SLR and long lens are too heavy and the low light conditions push the compact super zoom that I can comfortably wear on my hip, to its absolute limits. Consequently, please excuse a couple of the rather grainy images that I have included later in this post. However, the mere fact that I was able to capture these pictures encourages me to share them and their story with you. Over the many years that I have walked or cycled around our permanent creeks and wetlands I have only caught the occasional glance of Australian water rats. The tell tale ‘V’ shaped wake that they leave and their low profile in the water make them unmistakable. Unfortunately, after a brief appearance they invariably dive or disappear into the tangle of reeds and grasses on the water’s edge. 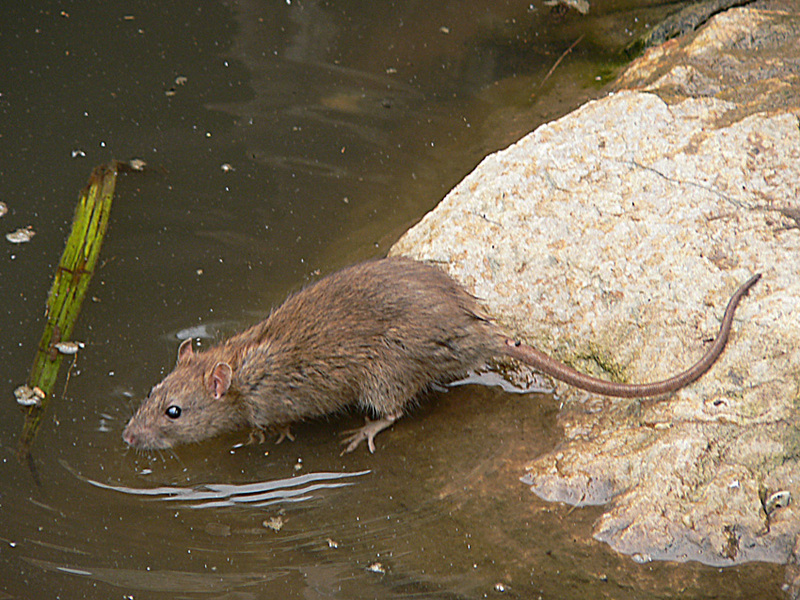 It is also quite easy to confuse them with common rats, which swim well and often live close to waterways. Unlike their terrestrial cousins, water rats are a little more robust have a slightly blunter face with a heavier covering of whiskers. Their back feet are also webbed and they have a white tip to the tail. Back to my tale of coffee and misty mornings; last Saturday I had cycled from home to the weir and was peddling along the track that runs south above the river when I noticed a classic ‘V’ shaped wake in the water. I quickly dismounted, whipped off my helmet and gloves and pulled out my camera. The water rat swam upstream diving periodically and I was able to walk slowly along the trail watching it for around 5 minutes. Eventually it disappeared into the undergrowth near the bank but not before another one paddled close by affording me a rather unique photo opportunity. However, as I mentioned at the start of this piece, the light conditions were far from perfect and my target animals were the best part of a 100 metres away. A lot of frames and little Photoshop produced the two images you can see here. Encouraged, I returned the next day and sat quietly on the bank for the best part of an hour, hoping for a repeat performance. 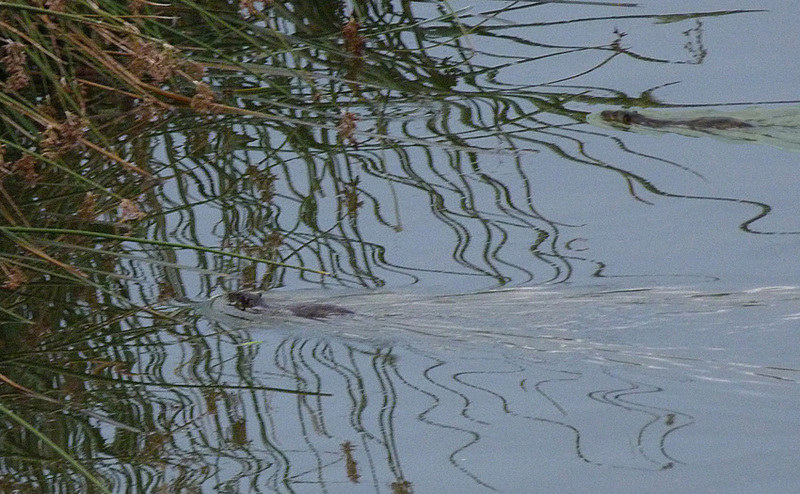 I did see one water rat for a brief moment but I could not focus rapidly enough to get a clear image. 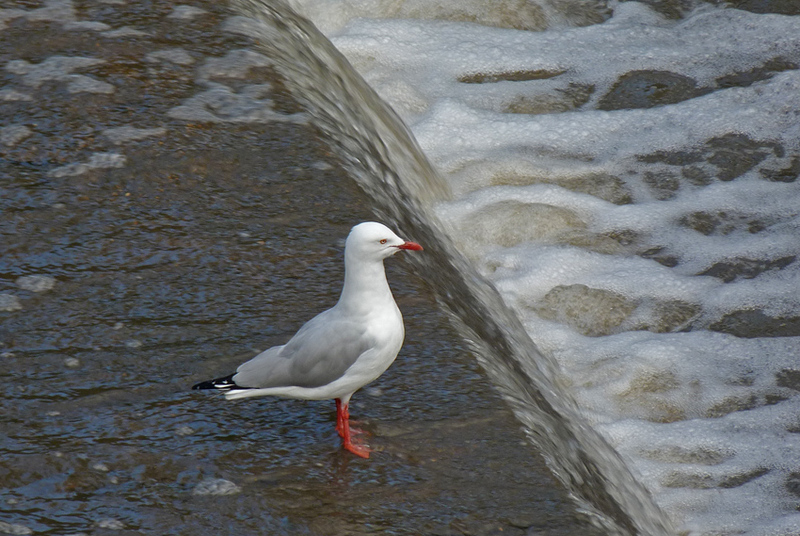 At this point, the coffee beckoned and I cycled back to the weir stopping a couple of times on the way to enjoy the winter’s early scattering of leaves on the river bank and watch a pair of silver gulls wading in the water cascading over the sluice gates. Now that I know there are several water rats in the area I am determined to travel the same path on foot over the next few months with my DSLR to see if I can improve on these pictures. But for now I am thrilled to have seen the little animals foraging in the wild and to have captured a few simple images.